Gelegenheiten für interdisziplinäre Kooperationen zu erkunden. Please follow this link to acces the whole review. In the aftermath of 9/11, many governments have increased their surveillance efforts in an attempt to fight organized crime and terrorism. The current rise of state mass surveillance has been facilitated by the internet, advancements in data-processing, intelligent face recognition and various other new technologies. The unprecedented extent to which even liberal democracies monitor their citizens raises pressing moral questions, especially concerning the relative value of privacy and security. On the one hand, many scholars have stressed the importance of privacy both for the flourishing of individuals as well as for the functioning of a democratic society as a whole. And it is arguable that state mass surveillance constitutes a serious infringement of citizens’ privacy. On the other hand, extensive and sophisticated surveillance efforts hold the promise of greater security, the provision of which is among a state’s primary purposes. Indeed, it has even been suggested that increased surveillance is imperative to prevent catastrophes of a global scale (catastrophic risks), such as terrorist strikes with nuclear or biological weapons of mass destruction. The workshop seeks to advance our understanding of the ethical significance of state mass surveillance, bringing together philosophers with experts from other fields such as law and computer science. Guest speakers include Erik Krempel (Karlsruhe), Kevin Macnish (Twente), Nóra Ní Loideain (London/Cambridge), Ingmar Persson (Gothenburg/Oxford), Scott Robbins (Delft), Patrick Smith (Singapore), Titus Stahl (Groningen), Frej Thomsen (Copenhagen), Carissa Veliz (Oxford). The workshop is funded by the Thyssen Foundation. Registration: To register for this event (free of charge), please send an email to peter.koenigs∂kit.edu until March 31st. The interview is available on the new subpage "podcasts". 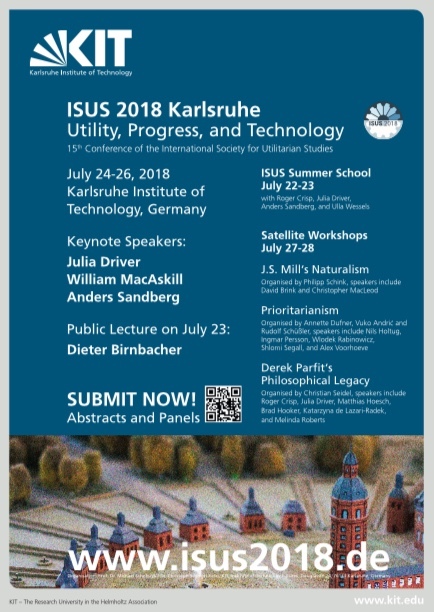 Erik Fisher is an associate professor at the School for the Future of Innovation in Society at Arizona State University and spends the fall semester 2018 in Karlsruhe working with colleagues at ITAS and ITZ. He is a leader in the field of socio-technical integration, a field that he has founded and brought to international academic recognition, followed by considerable research and policy uptake. At KIT, Fisher was leading a series of introductory workshops on the Socio-Technical Integration Research (STIR) approach and participated in various workshops, among others in a workshop on Socio-Technical Integration organized by Alexandra Hausstein (program). At Arizona State University Fisher directs the STIR Cities project, which studies and compares diverse organizations in Phoenix, Arizona and Portland, Oregon working on smart grid technologies. Supported by a National Science Foundation grant, the project develops the notion of local and regional sociotechnical imaginaries and brings social science engagement out of the laboratory and into the (smart) city. Fisher is editor-in-chief of the Journal of Responsible Innovation. Formerly, he served as director of the STIR project and of a PhD program in Human and Social Dimensions of Science and Technology, as well as associate director of the Center for Nanotechnology in Society at ASU. In this interview with Joshua Bayless, Erik Fisher describes STIR as a methodto investigate the possibility and utility of incorporating social and ethical considerations directly into scientific research and technology development. Our workshop brings together researchers from history, sociology, communication sciences, and philosophy to tackle the question of temporal regimes inscribed into or attributed to technology through materiality, discourse, or practices. The term “temporal regimes” of technologies puts the time dimension center stage in our thinking about technology. We argue that past, present, and future technologies cannot be treated as distinct entities. Rather, societies have been, are, and will be confronted with a complex set of technologies which pertain to different and diverse temporal regimes and in which past, present and future are superimposed in hybrid ways. We see this workshop as an initial step towards developing new questions and theoretical frameworks on the temporal dimensions of our technological world and the way we interact with them. In Ihrem neuen Buch „Was schulden wir künftigen Generationen? Herausforderung Zukunftsethik“ (Reclam 2018) diskutiert Kirsten Meyer die Frage, wozu wir zukünftigen Personen gegenüber verpflichtet sind und worin unsere Pflichten gründen. In einem Workshop am 5.12.2018 wird dieses Buch ausgehend von Kommentaren gemeinsam mit der Autorin diskutiert. Alle sind herzlich eingeladen! Die Veranstaltung findet statt von 14:00 bis 16:30 in der Douglasstr. 24, 5. OG, Raum 511. Um vorherige Anmeldung bis zum 30.11.2018 wird gebeten (per E-Mail an Yvonne Siegrist, yvonne.siegrist∂kit.edu). The aim of this workshop is to arrive at a true cooperative level of joint research regarding the status of Industrie 4.0 in Germany and Made in China 2025 in China as vision in different national, institutional and disciplinary settings. The focus lies, both, on the models and visions as well as on the national strategies for putting this vision in practice and its actual and expected societal impacts. The challenges, we are facing are not only to bridge national cultures and strategies but also to integrate disciplinary knowledge from Engineering Sciences and Social Sciences and Humanities. 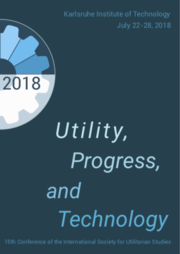 Public debate around digitalization of production systems show that on the long run we have to face questions of future of work in highly industrialized societies at a global scale. Therefore, we conceptualize this workshop to be interdisciplinary and comparative, allowing for debate and common reflection. Mit der Untersuchung von Begriffen, die im Kontext Mensch–Technik–Natur zentral für das menschliche Selbst- und Weltverständnis sind (wie "Autonomie", "Risiko", "Verantwortung", "Privatheit", "Hybris"), möchte die Professur dazu beitragen, (v.a. durch technische Entwicklungen getriebene) Transformationsprozesse dieses Selbst- und Weltverständnisses in angewandten Kontexten (wie Social Robotics, Big Data, Energieversorgung, Automatisierung, Geo-Engineering) philosophisch zu reflektieren. 3. INSIST-Nachwuchstagung: Von Menschen und Maschinen. Interdisziplinäre Perspektiven auf das Verhältns von Gesellschaft und Technik in Vergangenheit, Gegenwart und Zukunft | 05.10.2018–07.10.2018. 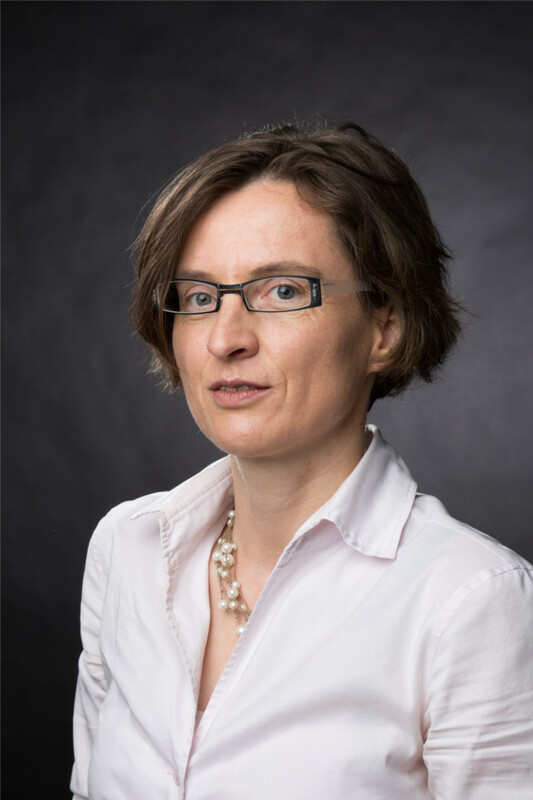 Gerahmt durch zwei Keynotes von Prof. Dr. Gabriele Gramelsberger (RWTH Aachen) und Prof. Dr. Martina Heßler (HSU Hamburg), soll die interdisziplinäre Nachwuchstagung “Von Menschen und Maschinen” verschiedene Möglichkeiten eröffnen, an aktuelle Forschungen und Debatten um das Verhältnis von Menschen und Maschinen anzuknüpfen. Weitere Informationen sind auf der Tagungswebseite verfügbar. Times of war drive enhanced resource exploitation. Salvage is thus one essential and yet underexplored characteristic of industry, business, and society in warring nations. It challenges historiography in several ways. For one, waste and recycling often represent grey areas of economic activity, including the black market or informal work such as volunteer or forced labor. For another, waste handling pervades industrial production as well as everyday life, and under conditions of war and shortage, it became both a political means to mobilize the ‘home front’ and a way for individuals to survive constant shortages. The international workshop “Waste Recycling, War and Occupation: A Transnational Perspective on World War II,” organized by Heike Weber (KIT) and Chad Denton (Yonsei University) thus aims to bring together the different historical sub-fields that have carried out research on wartime recycling so far, in particular, business history, the history of war and society, the history of technology, and environmental history. The workshop will analyze the scope and impact that recycling had during World War II, both for several regions and for different industrial branches. Additionally, it will ask what impact wartime recycling had on later patterns of resource use. Mit der W3-Professur für Soziologie II ist die wissenschaftliche Leitung des Methodenlabors am House of Competence (HoC) des KIT verbunden. Die Professur wird in verschiedenen, teils interdisziplinären Studiengängen (z.B. Wissenschaft – Medien – Kommunikation B.A./M.A.) und im Bereich der Schlüsselqualifikationen lehren; erwartet wird die Bereitschaft, sich an der Weiterentwicklung der Studienangebote zu beteiligen. Am 19. Oktober 2017 wurde im Zentrum für Kunst und Medien (ZKM) in Karlsruhe die Ausstellung „Open Codes – Leben in digitalen Welten“ eröffnet. Die Installation „OpinionMap – What should one eat?“ wurde gemeinsam vom Institut für Theoretische Informatik und dem Institut für Technikzukünfte/Institut für Philosophie aufgebaut und lädt zur Interaktion und Mitgestaltung ein. Im Rahmen des OpMAP-Projektes werden algorithmische Methoden zur Analyse und Darstellung komplexer Debatten und Meinungslandschaften erforscht und implementiert und hier als Landkarte der Meinungen zu Essgewohnheiten graphisch dargestellt. Durch das Beantworten von Fragen können Besucher im ZKM sich ihren Standort auf dieser Karte anzeigen lassen und durch ihre Antworten selbst zur Veränderung der „Ländergröße“ beitragen. Weitere Informationen gibt es auf der Seite des ZKM und auf der Seite des Projektes. 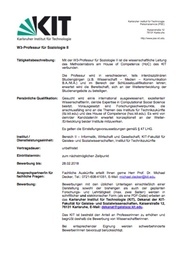 Heike Weber hat im Juni 2017 die Professur „Technikkulturwissenschaft“ am Institut für Technikzukünfte des KIT angetreten. Sie forscht zu Technik im Alltag und der Rolle von Nutzern im technischen Wandel, zum Verhältnis von Innovation und dem „Momentum“ des Alten (z.B. bestehende Infrastrukturen oder Wertsysteme) sowie – unter dem Schlagwort des „Entschaffens“ (Unmaking Technology) – zu Fragen von Müll, Abfall und Recycling. 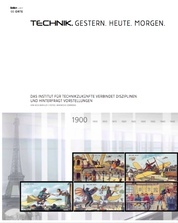 „Technikkulturwissenschaft“ wird Ansätze aus STS, Technik- und Umweltgeschichte und Kulturwissenschaft kombinieren, um die Wechselwirkungen zwischen Technik, Gesellschaft, Kultur und Umwelt zu untersuchen. 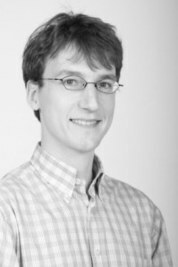 Zuvor war Heike Weber Professorin für Technik-, Umwelt- und Geschlechtergeschichte am Interdisziplinären Zentrum für Wissenschafts- und Technikforschung (Bergische Universität Wuppertal); weitere Stationen umfassen u.a. das Hermann von Helmholtz-Zentrum für Kulturtechnik (Humboldt Universität zu Berlin), das Münchner Zentrum für Wissenschafts- und Technikgeschichte (c/o Deutsches Museum), das Smithsonian (NMAH, Washington D. C.) und die EHESS (CRH, Paris). 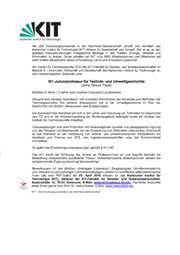 The workshop is financed by the ITZ , the Institute of technological Futures at KIT. Motivation: Engineers interact with their products and processes largely through models. Consequently model-based reasoning takes center stage in shaping our technological future. However engineers only rarely reflect about the nature of these models and how technical possibilities and actions are affected by the models’ properties and characteristics. Thereby models in engineering describe not only the product, i.e. the designed artefact, but also the generating process (via so-called process models). At the same time the models also shape and create both the artefact as well as the process. This clearly distinguishes them from scientific models that primarily aim to describe a certain target system. The importance of modelling has been steadily increasing over the past decades with improving computer technology. However a further step change is expected in the coming decade with the increasing prominence of industry 4.0, which brings together engineering from different engineering disciplines. Big data will also play an increasing role through the introduction of sensors monitoring and directing the use of the product and connecting products together. One of the engineering approaches to this is model-based system engineering where the aim is to model and simulate product properties and behavior from the onset. However underlying questions about the nature and influence of models have rarely been asked. Over the last decades or so, there has been a growing body of literature on models in the sciences. Much less research has been done on models on engineering design. The workshop is supposed to fill in this gap. Focus: With this workshop we aim to bring together design scholars, engineers and philosophers who have worked on model-based reasoning. The guiding question is as to what knowledge can be derived from models in engineering? And building on that: What actions do models afford? These questions are of relevance beyond the model debates as they may shed some light on the classical question as to what distinguishes scientific from engineering practice. How, if so, do results derived from models differ from more descriptive knowledge by means of normativity, functionality, and other? What are the relations between these aspects? What is the relation of process models to product models and thus to the designed artefact? How do process models structure the knowledge-generation in engineering design? What is the role of tacit knowledge in using a model and utilizing models-based result? What role can or should ethical or social values play in engineering modelling? What problems arise from a wrong/incomplete understanding of the role of model? Given that the epistemic status of model is interpreted differently by individuals and communities, what are the substantive barrier that arise for model based system engineering? Interdisciplinary: The research question we addressed with this workshop is formulated within philosophy of engineering, but it can only be answered in an inter- and transdisciplinary fashion because it requires expertise in both, philosophy and the engineering sciences. The workshop thus invites design researchers, engineers (particularly system engineers) both from industry and academia to discuss epistemic questions together with philosophers of engineering. Model-based reasoning takes center stage in shaping our technological future. Particularly in the fast developing field of system engineering and in what has been coined industry 4.0 models play a central role. We thus think that an enhanced understanding of what type of engineering knowledge can be created by models and how (and whether) models afford certain technological actions is thus one central question when reasoning about technological futures as done at ITZ. Thereby the focus of the workshop is on epistemic issues, but also ethical ones (via non-epistemic values in modelling) will be touched and thus the question as to what kind of technological future we want to create. The presented research will be published an edited volume with Springer. 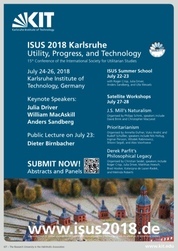 For more information about program, speakers and abstracts of the workshop please visit the ITAS-Website. 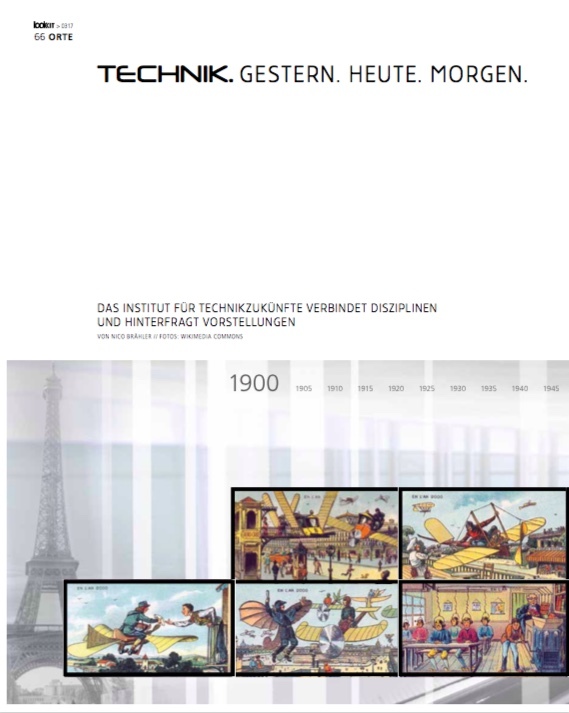 Seit dem 01.04.2017 ist das Institut für Technikzukünfte (ITZ) als ein interdisziplinäres Institut der wissenschaftlichen Technikreflexion mit Fokus auf Technikzukünfte eingerichtet. Es vereint am KIT unter seinem Dach das Teilinstitut für Philosophie, das Teilinstitut für Geschichte und künftig auch das Teilinstitut für Soziologie. Diese sind über ihre gemeinsame Arbeit am ITZ hinaus weiterhin als eigenständige Teilinstitute in Forschung und Lehre ihrer jeweiligen Disziplinen aktiv. Ziel der Arbeit des ITZ ist es ein fundiertes Verständnis für die Funktionsmechanismen und -bedingungen unserer modernen Gesellschaft im Zusammenhang mit moderner Technik und den Technikzukünften zu schaffen. 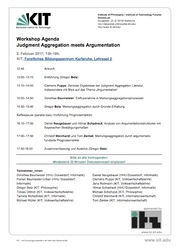 Interdisziplinärer Workshop „Judgement Aggregation meets Argumentation“, 2. Februar 2017 am KIT. Manchmal lassen sich Meinungsunterschiede auch durch gute Argumente nicht auflösen. Wie kann man dann trotzdem zu einer gemeinsamen Entscheidung gelangen? Und welche Rolle können Argumente dabei spielen? 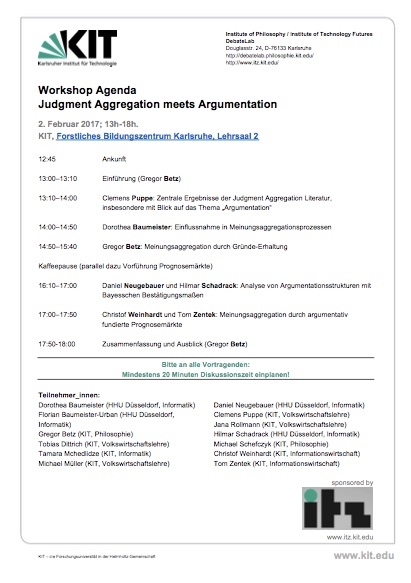 Diesen Fragen gehen Ökonomen, Informatiker und Philosophen auf dem Workshop nach.